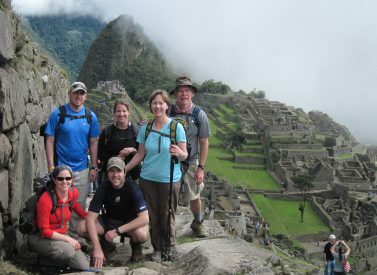 Getting trekking fit for your Inca Trail means you’ll enjoy your hike to Machu Picchu even more. With Inca Trail permits selling 4-6 months in advance, you have to plan ahead. Starting early means your heart and lungs will be get stronger and more efficient, which is what you want when you’re hiking at altitude – and don’t forget to acclimatise before setting off. Note: Please consult your doctor before starting any new kind of exercise, and be well acclimatised to high altitude before starting the Inca Trail. Some people are very good and fit cyclists, or swimmers, but walking uses different muscles. If you’ve never done any walking before, start with a few gentle short walks (as short as 20 mins) preferably with some inclines and declines. Small changes such as walking to work, taking a walk at lunchtime or home can make all the difference. For those that like targets, get a pedometer. Social? Join a walking group. You want to build up slowly, about 10% more each week. Set a target of being able to walk 2-3 hours a good few months before the Inca Trail. Build up to a walking weekend away, first with a big day walk, and then to full day walks for 2-3 consecutive days at least. South America’s paths are full of ups and downs, so build in ascents and descents. No countryside nearby? Put your rucksack on and walk up and down staircases while listening to some tunes. (NOTE: For all hikes, always plan routes, take maps, research the weather and area and let someone know where you are going). Camping conditions and sleeping mats/bags can give some people restless nights and without a good night’s sleep, even the fittest can feel tired the next day. Invest in a good thermarest and sleeping bag and set off and camp. Even better – tie in a weekend of walking with camping, to get a real feel for how it will be. Be kind to your feet and buy some good walking boots with plenty of ankle support. Wear them on those walks as much as you can before you depart. Same with rucksacks, jackets, everything – get to know your kit, and its limits – it’s no fun to discover your jacket is not waterproof during an Andean downpour. Carry a rucksack weighing approx. 5-7 kgs (11-13 lb) in which you should have a water bottle, some food, toilet paper and other personal effects, to get used to the weight. If you plan to walk with sticks, then practice walking with them. It is important to do strengthen your legs and upper body , as a supplement to walking. The walks are always more important, though. Step aerobics / step machine (there are thousands of steps on the trail). For the upper body, strengthening your core: stomach, back and shoulders, to help you carry your pack. Note: Always ask a professional trainer for advice before starting a weight regime. Walking is an incredibly rewarding and satisfying activity, but there are tough moments. You need to be used to setting targets, remaining positive when, if an ache kicks in or a blister pops up, and be ready mentally for what will be a challenge. By completing the training above, you know you have given your self the best chance to successfully complete and enjoy the Inca Trail. Looking about and enjoying the wonderful scenery is a great way to stay fresh and focused. A smile, a song and a joke go a long way in the mountains. And all the while you train, don’t forget to practice snacks! Find your favourites (peanuts, chocolate, energy bars) and take a supply with you to South America. Interested in trekking in South America ? Then check out Andean Trails Trekking Page or contact us for more information on the Standard Inca trail, Luxury Inca Trail, Trekking in Peru or active holidays in South America in general. Wow!! What an amazing trip. There really was no particular highlight as every segment was so different and so amazing! Basically the highlight was the whole trip! Everything ran like clockwork. All the tour guides/drivers were on time and all transport was on time (flights, buses, taxis). Everyone was friendly and helpful and not once were we made to feel scared or unwelcome. Thank you so much for all your help with organising this trip of a lifetime. I am so happy with my decision to choose Andean Trails as our guide for this five week trip and of course I will be recommending (have already actually) Andean Trails to family and friends.